Last week when I attended my Weight Watchers meeting I found a recipe in the Weekly flyer for Blueberry Squares. I'd also previously seen this recipe in my Weight Watchers Ultimate 3-Month Tracker spiral book and had planned to make it sometime. After seeing it again, I decided that time was now! I couldn't find any blueberry pie filling at the supermarket (I didn't go to my usual Wegman's - I bet they would have had it!) 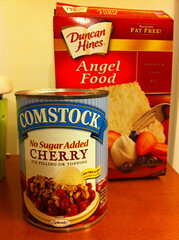 so I opted to use Comstock brand No Sugar Added Cherry Pie Filling instead. 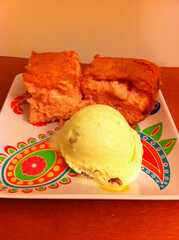 This has got to be the easiest cake recipe ever! Combine 1 package angel food cake mix with 22 oz light blueberry filling (do not add any other ingredients). Pour batter into an ungreased 13x9 inch baking dish, bake for 30 mins. Cool and cut into 24 pieces.